It’s not often that everyone can agree on the same thing! Ask anyone in Britain to name a brand known for amazing quality and M&S comes to mind. The company have been going since 1884, developing and expanding ever since. Food, home goods and of course fashion are just some of the things one can purchase from them. I’m super excited to be able to share some amazing news with you. Their fashions have gone from strength to strength and now we have an M&S Curve range! Partnering with the fiercely fun and stylish Danielle Vanier they created a collection with plus size women as their focus. 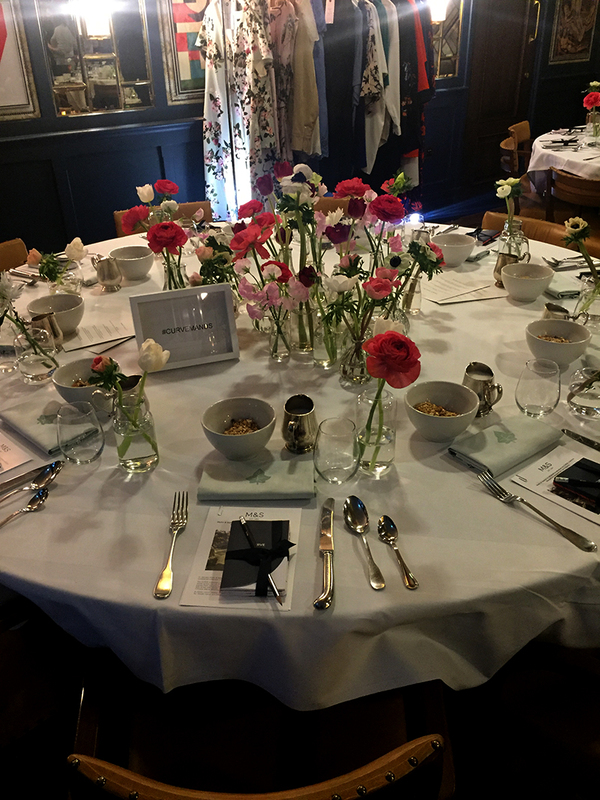 On January 9th fashion bloggers, media and press agents were all invited to a lavish breakfast at London’s Ivy Soho Brasserie. Hosted by Jo Hales, head of buying for the brand and Danie. What more can someone want than to enjoy a lavish breakfast, catch up with old friends and form new acquaintances? They wanted to share some details about the range with us and showcase some lines from the collection. We learned that the main range of clothing is based around a size 12 frame. 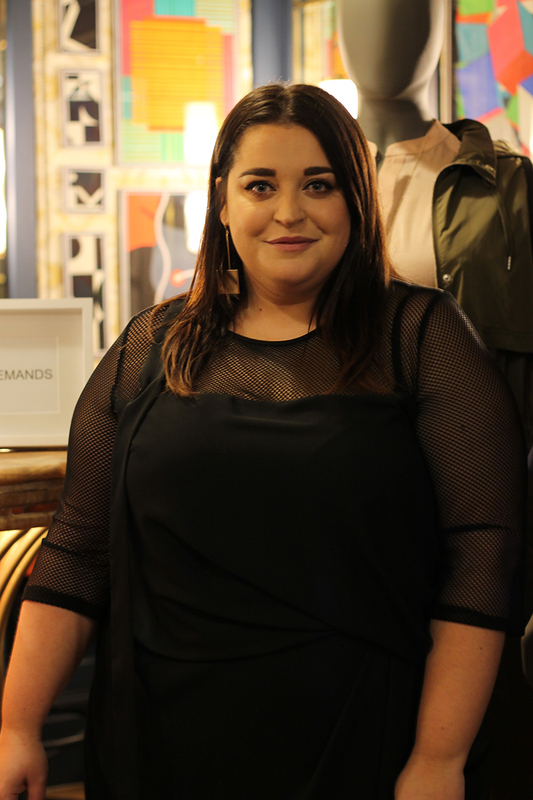 M&S wanted to focus creating the Curve collection on a size 24 woman, a true plus size collection! So far a great start to 2018, we have a fab new collection in sizes 18-32. Special attention went into the selection and cut of fabrics, specific print designs were chosen all with plus size women at the forefront. I can honestly say that nothing synonymous with the brand has been compromised when putting this collection together. Quality, style and variety is all a part of this range. Specially sourced size 20 mannequins will be also be used in the stores that carry the Curve collection. Great for women who aren’t so keen on shopping online and happen to see some stuff when picking up their groceries! 30 styles are already available. I tried on a few of the samples that were showcased. I love that there really is something for everyone. Some great basics, work wear and dressier options are all included. A particular item to catch my attention was the incredible biker jacket. The faux leather had stretch throughout including additional stretch panels. This is available in black and gun metal grey. Even when fastened there is plenty of room in the stomach and breast area! A must have if you ask me! There was also a hot trench coat and lurex plisse jumpsuit that everyone at the event had their eye on! Be sure to keep an eye on the site as more items from the curve range become available. I was thrilled to finally get my hands on some pieces from the range. Stylish, sophisticated and edgy lines can be found from M&S curve. There’s some fab items that would be great at the office, on a date night and for everyday wear. The half sleeve mesh midi dress is an item that to me is multipurpose. I can see myself wearing this casually with trainers and colourful accessories. I decided to bring a bit of a biker chick vibe to the look for these pics. 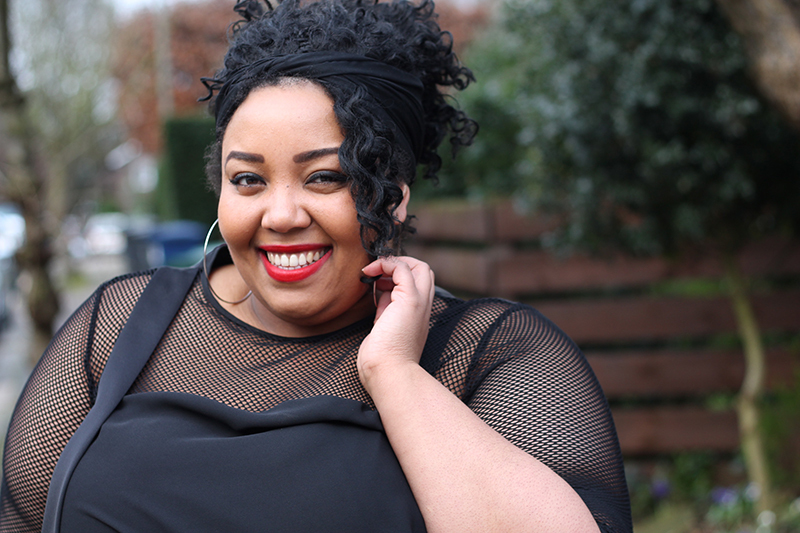 Deciding to double up on the mesh by wearing fish net tights and pairing it with the curve biker jacket with a pop of red lipstick. Of course being that this was designed by Danie it was going to have some fun features. Gathered detail at the waist, the doubled layered effect, silky sash detail at the front and back zip. Everyone in attendance at the event were excited that some top quality items would be available on the high street at a great prince point! I’ve seen the look book and there’s some really hot lines still to come. I can’t wait to see what they bring out later in the year! 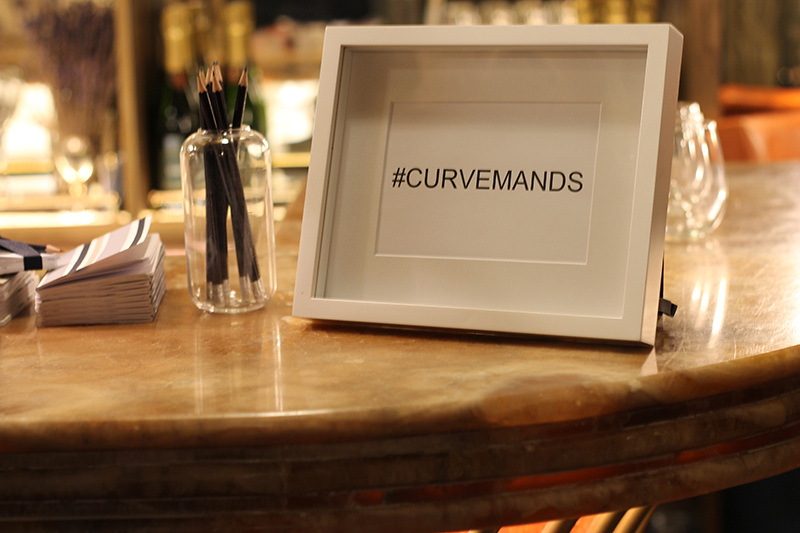 Check out the website and to look out for M&S Curve in a store near you! You look fabulous babe! Such a beautiful dress! The collection is indeed very stylish and I love the pieces you’ve chosen. The dress is so pretty and goes very well with the biker faux leather jacket. The dress is so stylish and you could wear it to any black tie event and at the same time I love it when you paired it with the leather jacket. It makes it look even more sophisticated. I wasn’t too sure of the few articles I had seen from the collection, however I love this outfit on you…. it is stylish, edgy, flattering and pretty damn cool!!! Some beautiful fashions and it looks like they did you right with a fine breakfast as well. The leather jacket really made your outfit pop! I have to admit I’ve only seen a few bits from the collection but they all look fantastic. I am loving the look of the jacket and the mesh dress actually looks like a dress I might wear. Considering this is a growing market that shows no signs of slowing down. I say it’s about time. I only hope this isn’t a temporary cash cow for M&S and they continue to offer clothes for the curvy market. Like everyone else I love M&S too! Mayah, I wish I was I could buy from M&S Curve. Sadly, I’m from the U.S. However, I’m so happy that you are out and representing and making boss moves. Thanks for sharing an awesome post, and I will be totally visiting your blog again. The biker jacket and mesh dress is a perfect combination and you look great! So good to see that M&S are designing some great plus styles. You are killing that outfit girl! Glad to see M&S are doing some great designs for the collection!